With life going great, a great family, a colorful solid police career – Captain Rolando Mendoza’s life took a sudden turn. Mendoza was fired from his post as chief of the Manila Police’s Mobile Patrol Unit in 2008 after he was charged with robbery and extortion, or the so-called hulidap practice of some police of planting evidence and seeking a pay-off from the victims. Mendoza claimed he was innocent and appealed to be reinstated. His sympathetic brother and fellow policeman, SPO2 Gregorio Mendoza, told reporters his brother had grown tired of waiting for justice. Rolando took matter in his own hands. 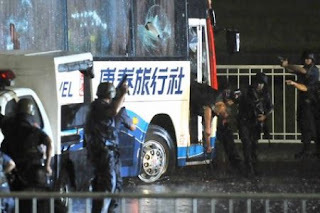 With anger and revenge in his heart, he took a tourist bus hostage and killed 8 foreigners in the process. He also died during the hostage drama. We can easily judge police officer Rolando Mendoza as someone who is violent and crazy. We could also say that he has brought shame to this nation. I don’t know Mr.Mendoza and his past, violent patterns or such. What he was trying to do was fight for justice. he wants his name vindicated. He felt angry at the justice system and that anger compelled him to confront the injustice he experienced. He was angry at the system that he was working with. His anger might be a righteous virtue but how he acted and take matters on his own hands proved to be fatal, futile and stupid. Interestingly, the God of the Bible does get angry like Rolando Mendoza. Jesus also got furious, angry and enraged. Mark 3:5 He looked around at them in anger and, deeply distressed at their stubborn hearts, said to the man, “Stretch out your hand.” He stretched it out, and his hand was completely restored. If you look at the hostage drama and our lives – we can see a spiritual parallel. Just like Rolando, God has every right to get angry at the sin that was committed against Him. He had every right to destroy and kill us – sinners. It is what we call God’s wrath and it is mention many times in the Bible. We as sinners deserve such treatment. Rom. 6:23 For the wages of sin is death, but the gift of God is eternal life in Christ Jesus our Lord. The truth is that everyone but the sinless Jesus merits the wrath of God. None of us deserves love, grace, mercy from God. Ephesians. 5:6 Let no one deceive you with empty words, for because of such things God’s wrath comes on those who are disobedient. However, God’s anger and wrath and the punishment we deserved is diverted because of God’s mercy which was displayed at the cross. Romans. 5:9 Since we have now been justified by his blood, how much more shall we be saved from God’s wrath through him! 1Thessalonians. 1:9-10 for they themselves report what happened when we visited you. They tell how you turned to God from idols to serve the living and true God, and to wait for his Son from heaven, whom he raised from the dead—Jesus, who rescues us from the coming wrath. The Bible uses the word PROPITIATION to designate how Jesus diverts the wrath of our angry God from us so that we are loved and not hated. The dictionary defines PROPITIATION as something that appeases or conciliates an offended power. So the question is what appeased God to divert His wrath towards us who deserves death? 23for all have sinned and fall short of the glory of God, 24 and are justified by his grace as a gift, through the redemption that is in Christ Jesus, 25whom God put forward as a propitiation by his blood, to be received by faith. This was to show God’s righteousness, because in his divine forbearance he had passed over former sins. 17Therefore he had to be made like his brothers in every respect, so that he might become a merciful and faithful high priest in the service of God, to make propitiation for the sins of the people. 2He is the propitiation for our sins, and not for ours only but also for the sins of the whole world. 10In this is love, not that we have loved God but that he loved us and sent his Son to be the propitiation for our sins. 16“For God so loved the world, that he gave his only Son, that whoever believes in him should not perish but have eternal life. 17For God did not send his Son into the world to condemn the world, but in order that the world might be saved through him.